• Net revenues amounted to 0 SEK (0) and operating result to -635 595 SEK (-648 108). The negative result is explained by development cost including personnel costs. • Capitalized development costs amounted to 10 785 329 SEK (9 399 418) at the end of the period. Patent costs amounted to 663 773 SEK (510 235). • The cashflow for the period amounted to -1 267 080 SEK (-1 047 286). • Available cash was 19 574 762 SEK (2 207 946) at the end of the period. • Total equity was 29 674 931 SEK (10 398 439) at the end of the period. The result for the nine months ending May 31st is included with -4 302 378 SEK (-1 419 780). Nothing except the result has affected total equity during the period. “It feels natural to start off with president Donald Trump’s decision to pull the US from the Paris Climate Accord. Even if the decision was regrettable, we found the reaction from the world encouraging for our industry. Politicians from around the globe condemned the decision, which shows that there is political unity on climate. But more importantly, CEOs who seldom comments on politics raised their voices. For example, both Lloyd Blankfein, CEO of Goldman Sachs, and Jeff Immelt, CEO of General Electric, took to Twitter to voice their disapproval. That companies takes such a clear stance on climate indicates to us that the transition to green energy no longer is driven by politics but by market forces. Renewable energy is growing because it is one of the cheapest ways to produce energy. Full stop. And the build out potential is enormous. The wind industry’s lobby group in Europe, Wind Europe, published a study in the beginning of June that showed that offshore wind power, both bottom based and floating, in a positive scenario can meet more than the entire energy demand for the whole of Europe in 2030 at very competitive production costs. When ambitious reports like Wind Europe’s sees a potential that big for floating wind power just in Europe, we feel that the timing for our cost conscious design is just right. And we get the same impression when we are out doing presentations. 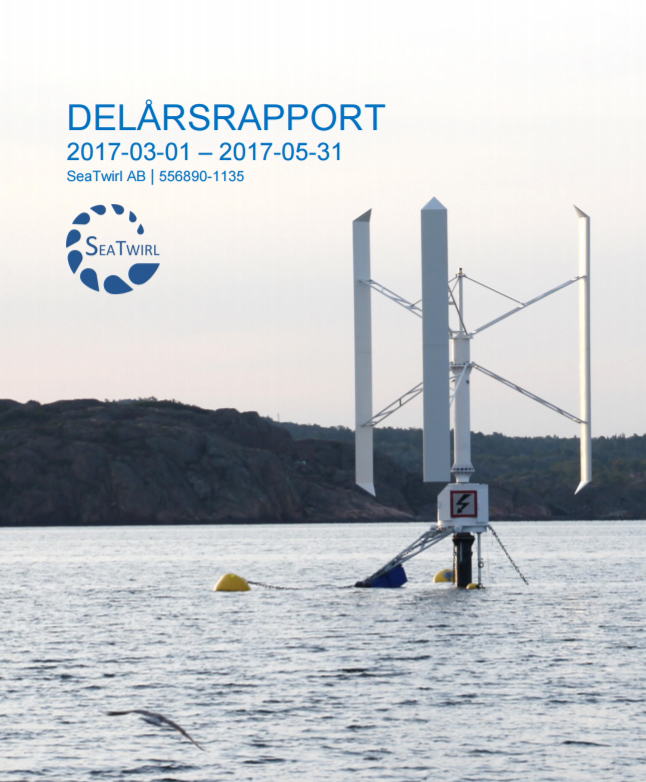 During the period we presented and won the Stena Line Propeller Prize and held appreciated presentations at a wind power conference in Stavanger and at Energimyndigheten’s and InnoEnergy’s Innovationsrace at Svenska Mässan in Gothenburg. Both during and after the period we have continued to take strategic steps important for our long term success. We have been granted a patent in the US for a turbine design that can withstand hurricanes. We have been granted a patent in Sweden that facilitates maintenance. And we have strengthened our organization with a project manager, a calculation engineer and a CFO. But our biggest focus still is on developing our next turbine, SeaTwirl S2, that will have a turbine effect of 1 MW.